The best rehab activities are the ones that are fun too! In this special guest post, Emma Burton from Auditory Verbal UK shows how you can teach basic math vocabulary to your child with a cochlear implant—and have fun baking together at the same time. Auditory Verbal UK is also currently the focus of the BBC Lifeline appeal. If you live in the UK and want more information about the charity, check out this special appeal program with Sara Cox. When it comes to math, most people think about numbers. But it is not just the numbers that are important, it is also the vocabulary. Children who are typically hearing are likely to naturally pick up this vocabulary through overhearing conversations. However, children who are deaf, and use a cochlear implant, may need to be exposed to new math vocabulary in a more purposeful way. This is easy to do through rehab activities at home. You can support your child to develop early math skills by introducing ideas of quantity, size, space, shape, time, weight, speed, and temperature into their play, and during their everyday activities. 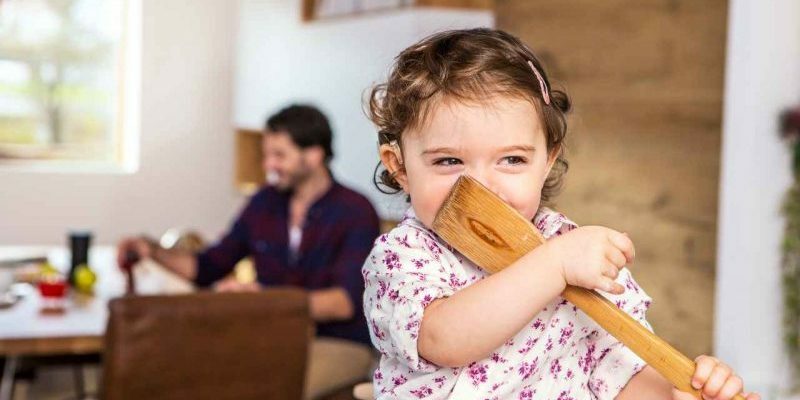 Being in the kitchen is part of an everyday routine for most of us, making it an ideal place for your child to see these math concepts being used meaningfully. Children love to help with baking, it can be great fun, and you get the added bonus of eating what you make! On a day when no one is in a hurry, make something simple that you know your child likes. Here are some tips for using a simple baking activity, like icing biscuits, to strengthen your child’s understanding of math concepts. *If you run out of powdered sugar, you can look in the bag and notice: “Oh no! It’s ALL GONE!” Then show your toddler to see what they think. Whichever recipe you choose, remember that the key ingredient is YOU. Happy baking! Want more rehab activities for the kitchen? Discover how to teach your child new words while making a fruit salad.